Email Productivity Tips. Reduce Stress. Get More Done. Reading emails as they come in is killing your productivity. You’re at your desk working on a project. Aka, doing actual work. You think, “It’s been three minutes. I should check my email.” So you take your attention off your project and check your email. Then you read the five emails that came in since you last checked email. You then go back to the project you were working on and spend 10 to 20 minutes trying to get your head around what you were doing before reading those very important emails. Finally, you’re back in the groove. You do five minutes of work and think, “I should check my email.” Then it’s 5:30 pm and you realize, with frustration, that you finished nothing all day. Living in our email inbox is why many of us start work at 5:00 pm or come into the office at 7:00 am to get “something done while it’s quiet.” It’s why we sleep and go on vacation with our phones, and are never really off. I am most productive on airplanes without WIFI. Without WIFI I’m not tempted to check my email every three minutes or check Facebook to read about what people I barely know and don’t really care about are doing. Without WIFI all there is to do is what I need to do. There are no other meaningful distractions, except for the B-grade movie I didn’t really want to see anyway. I am focused. And as a result, I get a lot done. I’m also less stressed. Because I’m focused, doing one thing a time, I’m not worried about everything I still need to do. If you want to get more done and be less stressed, do one thing at a time, for a defined period of time. Decide how long you’re going to work on something, and work on that item for that period of time, with no distractions or interruptions. You may only work on something for ten or twenty minutes, but do only what you said you would do for that time period. Then you can check your email. Productivity experts suggest you only check your email three times a day, for example, once in the morning, right before or after lunch, and at the end of the day. I find this hard to do. Like you, I feel pressured to check my inbox. Or I use my email to avoid the work I really need to do. But I know that constantly being in my email inbox has me distracted and not doing the work I really need to do. And as a result, I’m stressed and spend my evenings and weekends working on projects that require focused time. Do one thing at a time, for a defined period of time. Just try it. If you’re going to read your email, give yourself 20 minutes, and do nothing but read, reply, and delete email. At the end of 20 minutes, do whatever you said you would do next, for as long as you decide, and nothing else. 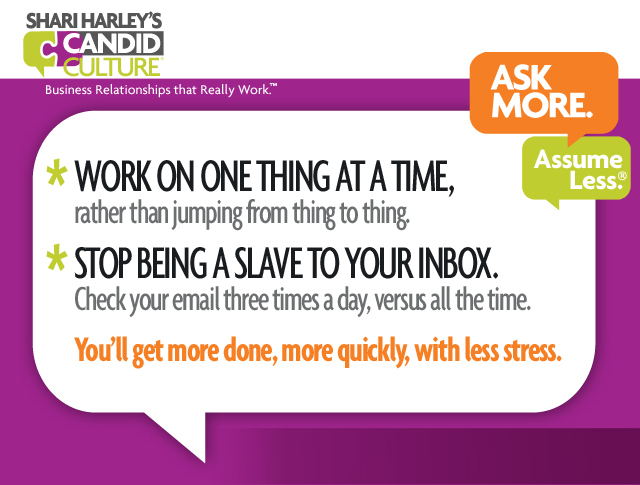 See if you get more done, in less time, with less stress. You might just leave work earlier and have time to do something besides work. Thank you for this! I often find myself especially checking email to procrastinate on big/difficult projects, then working a ton more hours than necessary just to get them finished. My goal is to write down 5 things a day I must get finished, then give myself specific amounts of time to work on each task to completion before I can check email/switch to another task. We’ll see how it goes! THANK YOU! This is such a great reminder to not be our own worst enemy’s while switching back and forth to email all of the time. Why is it that we feel compelled to do this?! This was a timely topic including stress as part of the scenario.